Characteristics: On younger trees, the leaves of B. rupestris are palmately-lobed. As the tree matures, the leaves become narrow and lance-shaped and the trunk begins to take on a swollen appearance, which can become quite pronounced in older specimens. Flowers are small and pale yellow in color. 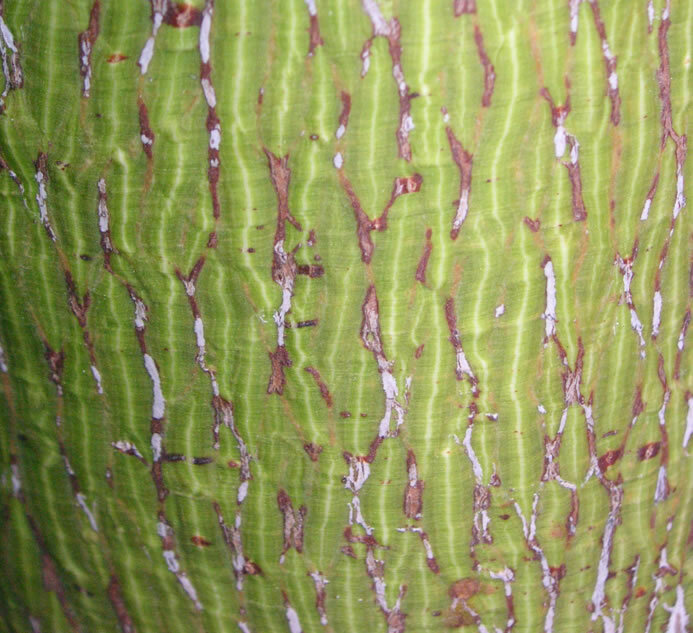 Bark is lime green on young trees and becomes fissured as the tree ages and expansion occurs. Natural History: Native to the eastern side of Australia, Kurrajong (an Aboriginal term) is found in Queensland where it survives in dry conditions. When brought into cultivated landscapes, overwatering and bad drainage can cause problems for the plant. Similar to Brachychiton populneus, the Queensland Bottle Tree can quickly succumb to Teas Root Rot during our humid summers. Cultivation Notes: Propagation of Brachychitons can be accomplished by either seeds or cuttings. Seeds are reported to germinate with little treatment and early growth is quick. 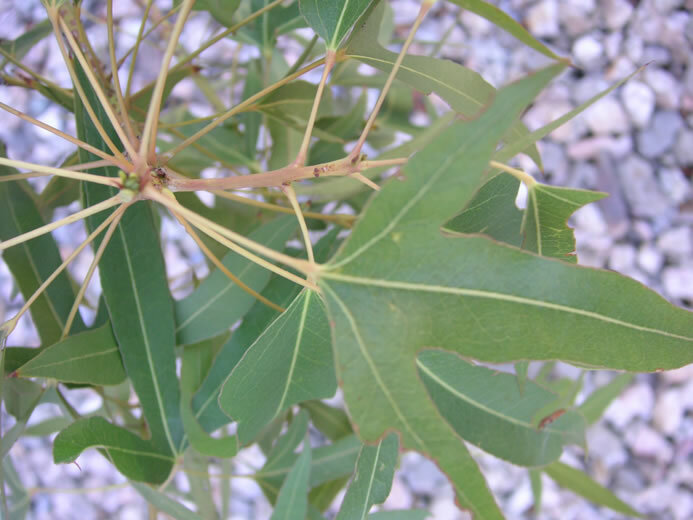 ====================================================================== Natural History of the UA Campus Arboretum Specimen: The UA Kurrajong was started from a cutting; the source tree is here in Tucson. Since installation in 2005, the UA tree has increased more than 12 feet in height. It is thriving in post-construction soil on the east side of the Math Building. Brachychiton rupestris is suitable for USDA Zone 9 (Tucson) if protected on cold nights when young.